Are you or your loved one looking for an extra hand to help out around the house? Do you find yourself constantly worried about your loved one when they are left at home alone? We are here to provide you with the assistance and peace of mind you and your family are looking for. Aging safely and happily at home allows elderly individuals to hold onto their independence while receiving the non-medical professional care they need. Offering a wide variety of services such as meal preparation, light housekeeping and companionship, 24 Hour Home Care has been providing top-notch care and quality customer service in the area for the past several years. 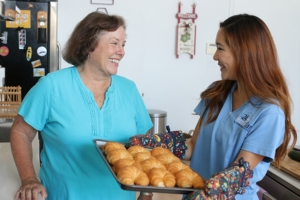 Our commitment to seniors and their family members has resulted with our company being regularly regarded as the best senior in-home care provider in the Solana Beach area. A complimentary consultation is available, where a tailor-made care plan will be established based on the clients needs and expectations. A caregiver will then be hand-picked based on the prescribed care plan and with the needs of the client in mind by our highly skilled care team. All caregivers are thoroughly trained with our Signature Specialty Training’s, including fall prevention, diagnosis-specific nutrition, emergency preparedness through the American Red Cross and Alzheimer’s & Dementia specific training’s. By combining the latest technology, outstanding customer service, and industry-leading innovation, the San Diego Office will provide you and your loved one with a degree of home care that is unrivaled. Do you and your loved one a favor and call (858) 529-6230 to experience the 24 Hour Home Care difference today!